This is a Lean Six Sigma Certification Preparation Training Course. Problem-solving is a critical skill that helps students grow on professional and personal levels. Lean Six Sigma provides a practical framework for solving problems. This Lean Six Sigma Training & Certification course empowers students to think critically, identify problems and work together to solve them. After completing this course, students will see the world with new eyes and be inspired to create positive change. In this 180-hour Black Belt Course, you will actively practice techniques for both quantitative and non-quantitative analysis, and gain the project management skills necessary to get projects done. The course consists of 36 modules and follows the Lean Six Sigma DMAIC process, just as you would do for a real project. Black Belt Minitab v12 consists of the modules below. 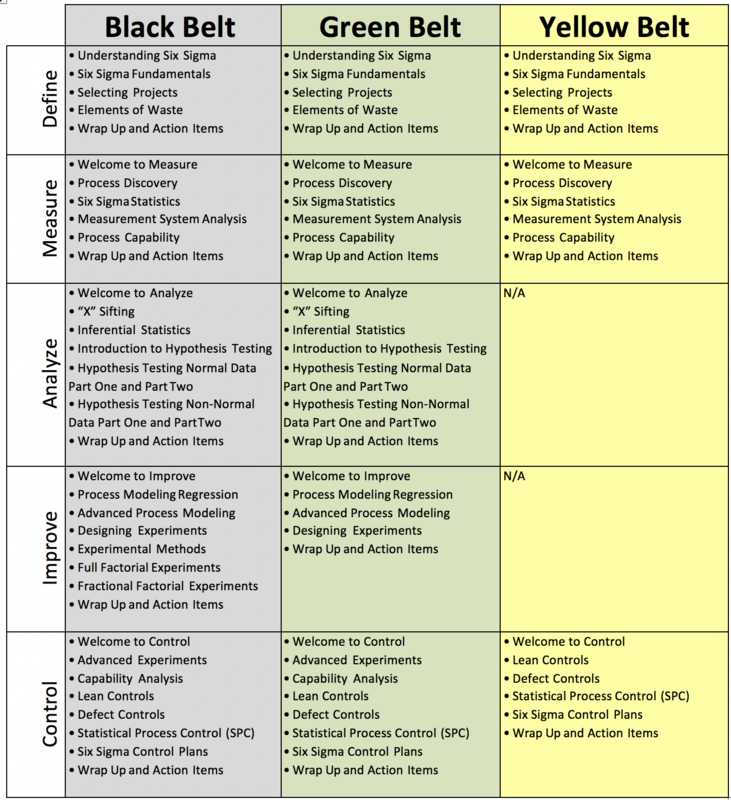 DEFINE PHASE - The purpose of this step is to define and describe process components and boundaries; identify owners, customers, and other stakeholders; define and plan project scope and metrics, and define team dynamics and tools. MEASURE PHASE - This step involves identifying and measuring the gap between current performance and the required performance. The measurement process is assessed, as well, to determine how accurate and precise it is. ANALYZE PHASE - This is when complex analysis tools, for example, the fishbone diagram and the Pareto chart, are used to determine the root causes of the errors. The causes are listed and prioritized. IMPROVE PHASE - After identifying and analyzing the root problems, they are either improved or eliminated. Solutions are identified. If the solutions are obvious, they are implemented right away, otherwise, a detailed implementation plan is designed. CONTROL PHASE - After implementing the solution, the goal is to sustain it. Usually, a control plan is documented. Over 50% of this course consists of exercises and quizzes that prepares you to complete real projects. You control the pace of action, e-Learning brings the knowledge directly to you, no matter where you are or when you need it. You have complete freedom to explore and revisit lessons. Traditional classroom training is expensive, disrupts your schedule and expects you to absorb a large amount of instruction in a short period of time. With our e-Learning, you learn when you're ready and able, and you eliminate travel, material and software expenses. Our materials are preferred by major universities and consultancies. We are an accredited provider of online Lean Six Sigma content by the International Association of Six Sigma Certification, who regularly reviews and approves our content. Minitab Software is required to complete the course successfully. The MINITAB SOFTWARE IS NOT INCLUDED in the cost of your course. Microsoft Windows with Microsoft Office with Excel, Word, and PowerPoint, sound card and speakers or headphones, high-speed internet connection, internet browser (Internet Explorer 10+, Chrome 23+ or Firefox 17) and the latest versions of Adobe Acrobat Reader and Adobe Flash Player. The leader in online Lean Six Sigma training and technology, enables individuals and organizations of all sizes to advance their performance by delivering powerful, scalable tools for process improvement. The project sponsor typically owns the area in which the project resides and works for the Champion. They are accountable for project results and ongoing continuous improvement after the initial project is complete. In fact, the sponsor is often responsible for many of the team members on the project team. Leader Senior-level executive who is responsible for implementing Six Sigma within the business. Middle- or senior-level executive who sponsors a specific Six Sigma project, ensuring that resources are available and cross-functional issues are resolved. Champions and Sponsors Lead the Lean Six Sigma effort within a particular organization. They are responsible for working with leaders to set direction and select projects. 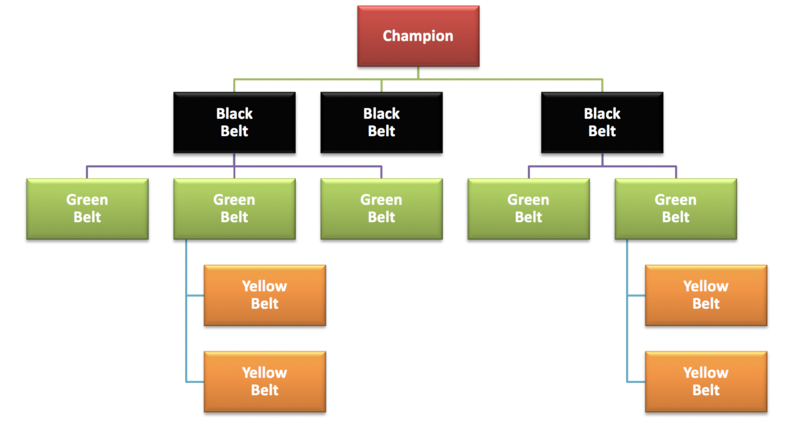 They resource teams and work directly with the master, black and green belts to execute projects. A full-time professional who acts as a team leader on Six Sigma projects. Typically has four to five weeks of classroom training in methods, statistical tools and sometimes team skills. Black Belts also lead Six Sigma projects. These projects tend to be larger scale and require full-time focus and broad six sigma expertise. Black Belts are able to provide this leadership due to extensive training, skill-set, and availability. They are effective change agents, can learn quickly and are adept at working with both similar-level teams and with higher level leadership. They can be ‘dropped’ into a project area without knowing a considerable amount about the area and be expected to quickly come up to speed in order to be effective. For this reason, they are in HIGH demand. Highly experienced and successful Black Belt who has managed several projects and is an expert in Six Sigma methods/tools. Responsible for coaching/mentoring/training Black Belts and for helping the Six Sigma leader and Champions keep the initiative on track. Master Black Belts Lead a Lean Six Sigma effort within a segment of an organization. They are responsible for working with green and black belts to execute projects and with champions to institutionalize Six Sigma. A part-time professional who participates on a Black Belt project team or leads smaller projects. Typically has two weeks of classroom training in methods and basic statistical tools. Green Belts Lead Six Sigma projects. Projects tend to be smaller scale than black belt projects. Green Belts are often team members, providing invaluable expertise for other black or green belt projects. They are usually either the Process Expert or Team Leader. The projects Green Belts work on are typically generated from within their own organization and will result in an improvement that directly affects their goals and deliverables for the year. Professional who has a general awareness of Six Sigma (through no formal training) and who brings relevant experience or expertise to a particular project. Process Owner Professional responsible for the business process that is the target of a Six Sigma project. The IASSC Certified Lean Six Sigma Black Belt™ (ICBB™) is a professional who is well versed in the Lean Six Sigma Methodology, who leads complex improvement projects, typically in a full-time capacity. A Lean Six Sigma Black Belt possesses a thorough understanding of all aspects of the Lean Six Sigma Method including a high-level of competence in the subject matters contained within the phases of Define, Measure, Analyze, Improve and Control (DMAIC) as defined by the IASSC Lean Six Sigma Body of Knowledge™. A Lean Six Sigma Black Belt understands how to implement, perform, interpret and apply Lean Six Sigma at an advanced level of proficiency. The IASSC Black Belt Lean Six Sigma Body of Knowledge™ is an assembly of a comprehensive set of topics and subject matters that are intended to be representations of the universally and commonly accepted, minimum competencies and core proficiencies requisite of Lean Six Sigma Black Belts. This well-established IASSC Standard is diversely recognized as a relevant and practical version of the knowledge expectations of Lean Six Sigma Black Belt. It consists of the primary sections of Define, Measure, Analyze, Improve and Control, which are each broken down into sub-categories consisting of individual subject matter topics. This respected IASSC Standard is an interwoven element to both IASSC Accreditations and IASSC Certifications. IASSC endeavors to ensure that Lean Six Sigma providers and institutions seeking IASSC Accreditation adequately demonstrated their alignment to the IASSC Lean Six Sigma Body of Knowledge. IASSC Certification Exams are constructed based upon the topics within the IASSC Lean Six Sigma Body of Knowledge. Through proctored (online or in-person)examination, candidates are expected to demonstrate that they have an adequate level of competence in the topics defined within the IASSC Lean Six Sigma Body of Knowledge. The IASSC Certified Lean Six Sigma Black Belt Exam™ is a 150 question, closed book, proctored exam with a 4 hour allotted time. 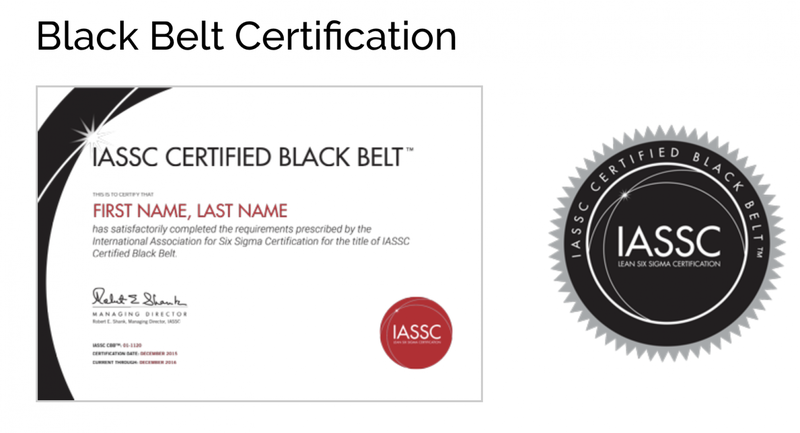 In order to achieve the professional designation of IASSC Certified Black Belt (IASSC-CBB™) from the International Association for Six Sigma Certification, candidates must sit for the IASSC Certified Lean Six Sigma Black Belt Exam and achieve a minimum score of 580 points out of a total potential of 750 points.